In Egyptian Uprising, A Tale Of Two Risks For U.S. U.S. policymakers face a dilemma: The democratic process in Egypt, if allowed to run its course, could bring to power a new government unsupportive of U.S. priorities. But if the democratic process is blocked, the outcome could be equally damaging to U.S. interests. For U.S. policymakers trying to gauge how American interests are at stake in Egypt, the popular uprising there is a tale of two risks. The democratic process, if allowed to run its course, could bring to power a new government unsupportive of U.S. priorities. But if the democratic process in Egypt is blocked, the outcome could be equally damaging to U.S. interests. The uncertainty over the Egyptian scenarios has brought even the most hardheaded foreign policy analysts to different conclusions. The U.S. aims in Egypt are longstanding and clear: maintaining peace with Israel, keeping the Suez Canal open, and supporting U.S. and allied efforts against al-Qaida and other extremist groups. Republican and Democratic administrations alike have seen these as vital U.S. interests, and they have consistently ranked them above the promotion of human rights and democracy. In practice, this has meant supporting Egyptian President Hosni Mubarak, no matter his faults. The recent political upheaval in Egypt has not fundamentally altered the assessment of these interests, but it has raised questions about what U.S. policy best promotes them. On one side are those who say the U.S. should stick with the Mubarak government and not be swayed by all of the people demonstrating for democracy. Among them are John Bolton, who served as U.S. ambassador to the U.N. under President George W. Bush. "We have a profound interest in the stability of the Israeli-Egyptian peace relationship," Bolton said, speaking on Fox News in the early days of the uprising. "We've got an enormously strong relationship with the Egyptian military. 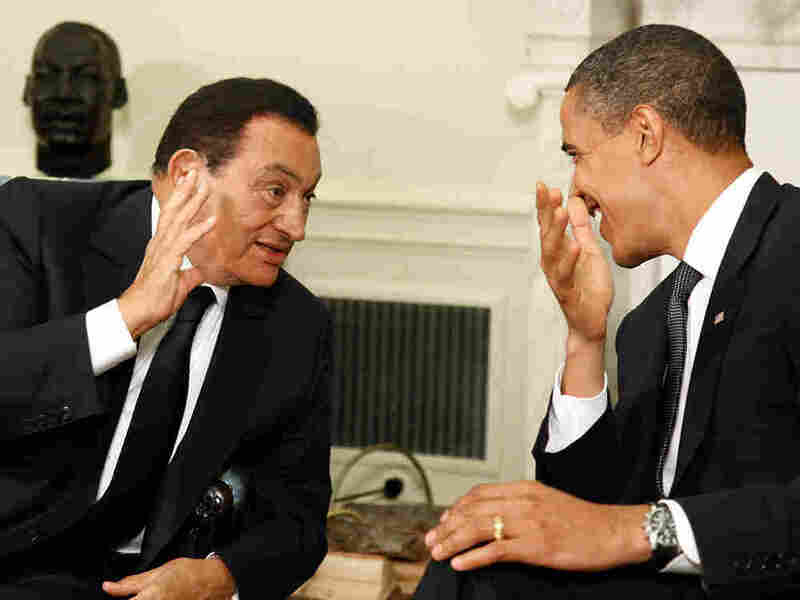 Mubarak ... has been an American ally for 30 years. In any kind of a democratic Middle East, I think the force that is going to come to the surface is going to be nationalism. Arab-Israeli peacemaking is likely to suffer some kind of a setback. "These are not things you toss away lightly against the promise, the hope, the aspiration for sweetness and light and democratic government." The risk from this point of view is that the people in Egypt or elsewhere in the Middle East, when given the opportunity to choose their leaders freely, might elect governments that are hostile to Israel and to U.S. strategic interests. "In any kind of a democratic Middle East, I think the force that is going to come to the surface is going to be nationalism," says Ray Takeyh, a Middle East scholar at the Council on Foreign Relations. "Arab-Israeli peacemaking is likely to suffer some kind of a setback." Some staunch defenders of Israel, however, see a possible strategic payoff in supporting Egyptian democracy. The opposition movement there could produce a new parliament, one that is not a rubber stamp for the Mubarak government. While such a development could empower extremist groups, including the Muslim Brotherhood, that would want to stand up to Israel, they might find themselves outnumbered. "The hope would be that you get a debate in Egypt, for the first time, over relations with Israel, and that that debate [would be] won by people saying, 'We don't want a war with Israel,' " says Elliott Abrams, who advised Bush on Middle East policy. "If you have debates in the Egyptian parliament that come out with a majority for maintaining the peace treaty, and the Muslim Brotherhood is involved in those debates and accepts its defeat, that's actually an advance for peace in the region." Abrams, now a Senior Fellow at the Council on Foreign Relations, argues that the key to achieving stability in Egypt and the rest of the Middle East is building the political center. In this sense, he argues, the significant risk to U.S. interests in Egypt lies not in supporting the democratic movement, but in supporting an autocrat like Hosni Mubarak. "This guy has ruled Egypt for 30 years, and as he leaves, the Muslim Brotherhood is stronger than ever," Abrams argues. "Why? Because he was actually crushing the center, not the Brotherhood." With the political center "crushed" in Egypt, the road ahead does remain risky. New governments in Egypt and elsewhere might be less friendly to the United States. Cooperation in counterterrorism could suffer. U.S. military access to the Suez Canal could even be jeopardized. The key U.S. interests would be called into question. On the other hand, those challenges may not look so serious if these governments are successful at reforming their economies and modernizing their societies. "If the region manages to stabilize itself and become more self-governing," says Takeyh, "[if] its economies are more self-sufficient and equitable in terms of distribution of wealth, if the region is at peace with itself, then it may not actually require an external guarantor." That guarantor of stability and security is now the United States. But the exercise of that role comes at the cost of democracy, and it is a cost that must now be recalculated.